The Milford Point Hotel is located on Milford Point Rd. in Milford CT. It sits on 30 very scenic acres. It was very popular between 1825-1849. I saw an old postcard of the hotel on the web once, but unfortunately I haven't been able to locate it again. When I went to find the location of the hotel at Milford Point I was glad to find the hotel still standing. You could just imagine all the festivities and summer parties that went on there. The top picture is a view of the back of the old hotel. 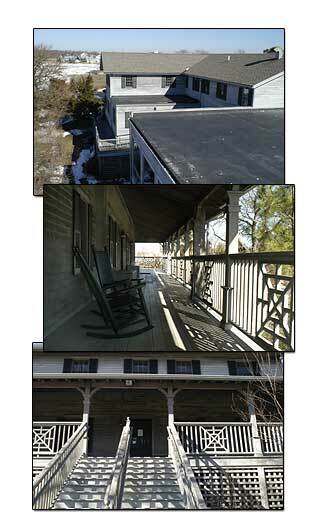 The center picture shows some vintage rocking chairs on the porch, and the bottom picture is of the old stairs going up to the porch. The hotel was built rather high in the air which is understandable, being so close to the Sound. But how it survived the Hurricane of 1938 must be a mystery. Inexpensive: Comfort Inn, $78-$88 a night. Moderate: The Lily Pad Bed & Breakfast, $110 a night, includes full breakfast, 203-876-9996.